A mole has what it takes to make a mess of your garden. It can be a shocking experience to look out the window and discover that your pristine lawn has been ravaged by ridges extending in every direction and punctuated by mounds of dirt. The animal responsible for this type of damage is probably a mole. Moles have shovels for paws and spend so much time burrowing underground that they don't even need eyes. Moles hardly ever come indoors, and even if you have one in your yard, there's little chance of seeing it. You'll know it's there, though, because it will make a mess of your lawn. Moles live everywhere except Antarctica. Several species inhabit North America, the most common being the eastern mole (Scalopus aquaticus), the star-nosed mole (Condylura cristata) and the hairy-tailed mole (Parascalops breweri). 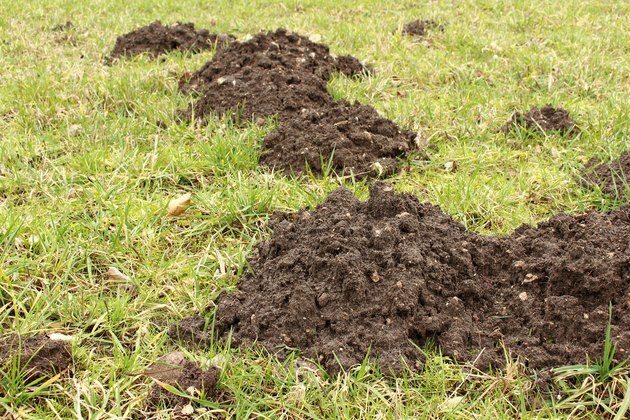 Unlike other burrowing pests like gophers and voles, moles are territorial and prefer to live alone, but even a solitary mole can deface the lawn with molehills and undermine it with tunnels. While searching for grubs and worms, which is the favorite food of these insectivorous mammals, a single mole can decimate your garden by damaging the roots of your favorite plants. Unlike gophers, shrews and voles, moles are not rodents, and they don't eat plant roots. The damage is a byproduct of of their incessant tunneling activity in search of food. It's difficult to get rid of a mole. Pest control experts have tried every trick in the book, and most agree that trapping is the most effective. Excluding the pest from key areas of the lawn and garden, planting vegetation that moles don't like, and soaking the lawn with castor oil can also be effective. All the dirt moles move around underground has to end up somewhere. The chances of actually seeing a mole are slim, but even so, it helps to know what one looks like. Covered in brown or gray fur, a typical mole is about 6 to 8 inches long. It has a long snout, paddle-like front paws and no visible eyes. Cats and dogs love to dig for moles, and if your pet delivers one to your living room, you'll note its somewhat pudgy body, short tail and luxurious fur. The fur has historically been used to soothe foot ailments like corn and warts, which is why modern remedies are called moleskin. If it's still alive, don't touch it without gloves. Moles can carry disease, including rabies. The damage moles do to the yard is their calling card. A hungry mole produces several largish piles of dirt—molehills—throughout its area of activity. The dirt it uses to make these comes from the tunnels it burrows, and the tops of these tunnels are often visible. They snake throughout the yard, and the main tunnels are especially obvious running next to walkways and foundation walls. Noise and vibrations usually send moles to another part of the yard. Toy windmill: A toy windmill makes a lot of noise and vibration when it spins. The idea is that, when placed on molehills, the noise will scare the mole away. A mole may not be a rocket scientist, but it wasn't born yesterday. If it's bothered by the noise, which it probably isn't, it will simply move to another part of the yard. Bottle-on-a-stick: Placing plastic bottles on sticks throughout the yard is a variation of the windmill method, and it doesn't work for the same reason. Flooding the tunnels: The only things worse than a yard riddled with mole tunnels is a yard riddled with tunnels full of water. There's a good chance of a cave-in, and the mole will probably just move somewhere else until things dry out. Fumigating: People have tried smoking out moles with car exhaust, and you can even attempt to do the job with store-bought smoke bombs. The reason this seldom works is the complexity of the tunnel network. It's virtually impossible to fill all the tunnels with smoke at the same time. Poison: You can spread poison on the lawn to kill grubs, which are a mole's favorite food, and the animal will then probably start eating worms. If you poison the worms as well, you'll rid the soil of some of its most beneficial inhabitants and risk doing permanent damage to your lawn. Brute force: Some people recommend watching the tunnels for signs of movement and stabbing the ground with a shovel. You might get lucky with this hit-or-miss technique, but you might also merely injure the animal. The most likely outcome is that you end up wasting your energy. 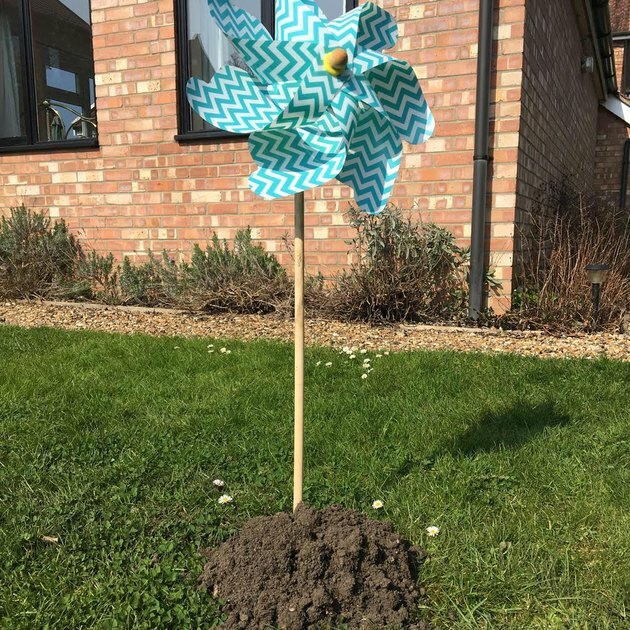 Electronic mole repellants: These are supposed to deter moles by creating vibrations in the ground, but they sometimes do the opposite by attracting worms. Mole traps have various designs, and not all of them are lethal..
Before you make the decision to trap a mole, keep in mind that these furry creatures aren't all bad. Any damage they do is inadvertent. They are simply looking for food, which happens to be a daily menu of more than half their weight in insects that might otherwise be eating you or your plants. 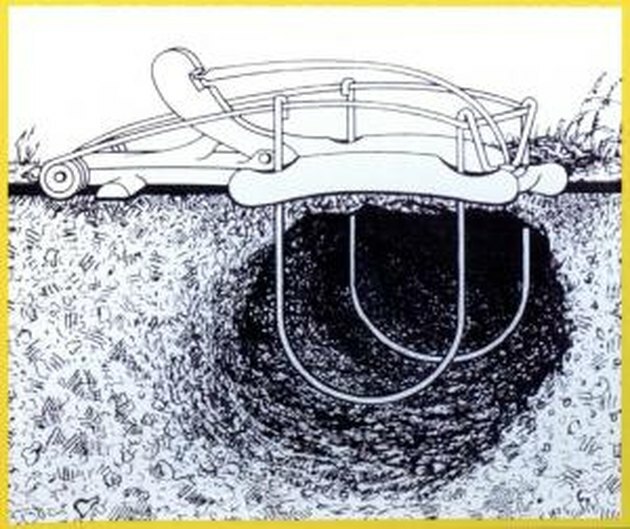 And by aerating the soil, moles can actually be beneficial. However, when the damage done outweighs the benefits, trapping is the best way to solve the problem. Many trap designs exist. Some slice, some plunge and some choke the unwary animals. You usually set the trap in the ground over an active tunnel so it can catch the critter as it runs by. If you purchase a trap, be sure to read the instructions for the proper way to set it. You can also buy live traps for moles. One such trap is cylindrical and fits inside an active tunnel. It catches any mole that passes by in a compartment so you can transport the mole elsewhere and release it. Be sure not to release the mole on someone else's property. 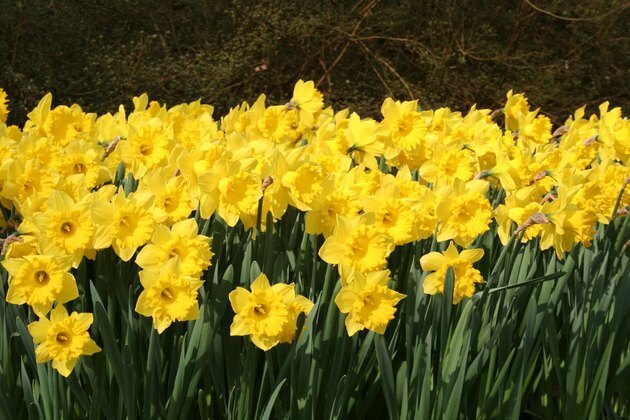 Daffodils are among the plants that moles don't like. Mole control is easier if you let Nature help. Among the safe, non-lethal and sustainable control strategies are numerous natural methods and folk remedies. They may work, but even if they don't, they won't damage, and may even improve, your lawn and garden. Under-water the lawn: Moles prefer moist soil, so if you let your lawn dry out for a few days, they may seek a new home. They may also dig deeper, so this method isn't a sure thing, but under-watering your lawn could be good for it if it was wet enough to attract moles. 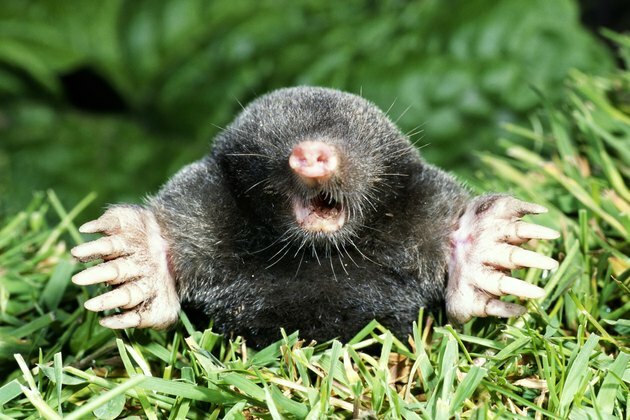 Plant vegetation moles don't like: Moles tend to stay away from daffodils, marigolds, aliums, fritillarias, euphorbia (mole plant) and castor beans. Keep in mind that euphorbia and castor beans are poisonous. Do not plant them in yards in which animals or young children are present. Exclusion: Surround the roots of plants you want to keep with gopher screen or hardware cloth. Use the smallest mesh available, because moles can squeeze through small openings. If you want to exclude moles from a section of the yard, create a barrier by burying gopher wire or hardware cloth a foot deep. Bend the bottom of the wire 90 degrees in the direction the mole would enter. Castor oil: Moles don't like castor oil any more than humans do. Mix 6 ounces of castor oil with 2 tablespoons of dish soap to make a concentrate, and mix one once of concentrate per gallon of water. Spray the mixture on the lawn with a garden sprayer. Castor oil doesn't kill moles; it just makes them feel the same way you do when you have to take it...maybe a little itchier. It's especially effective if you spray immediately after a rain. How Do I Get Rid of Moles Inside My House?